Is RASA sending this SMS only to me? 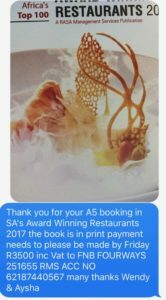 I do not appreciate receiving this image via text/MMS message earlier today and I wonder, if I’m alone or if there are other restauranteurs, who received something similar? I do not ever book any print advertising and know, that no one in my company does. 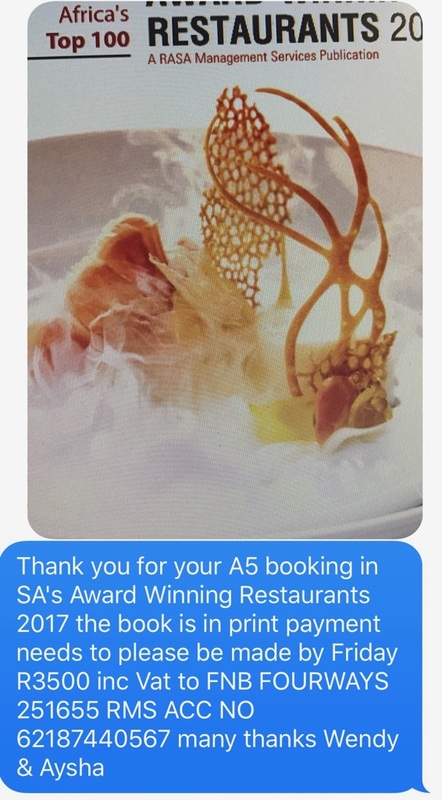 Imagine, if I had just forwarded this order confirmation to our finance department for payment and this payment reminder was sent to dozen or maybe even hundreds of restauranteurs, that you got in your database? After I posted this message on my Facebook and tagged the RASA and their frontwomen in it, it didn’t take her 5 minutes to call me and threaten with legal consequences, if I didn’t immediately delete the picture. What followed was a conversation with RASA’s legal counsel who could also only threaten to sue for damages due to reputational damages. This surprises me, as I’m only showing the communication you are sending out and explain the context. It seems, that I hit a nerve somewhere? 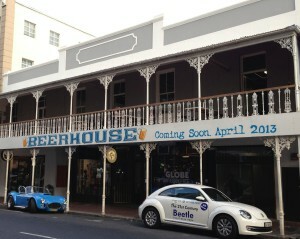 Bar below Beerhouse on Long Street available! 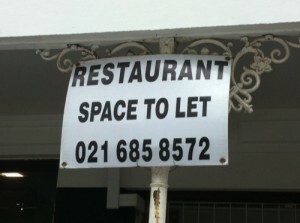 Update: The space is now available again after Baked Bistro closed after the owners meltdown! This unique store is ca. 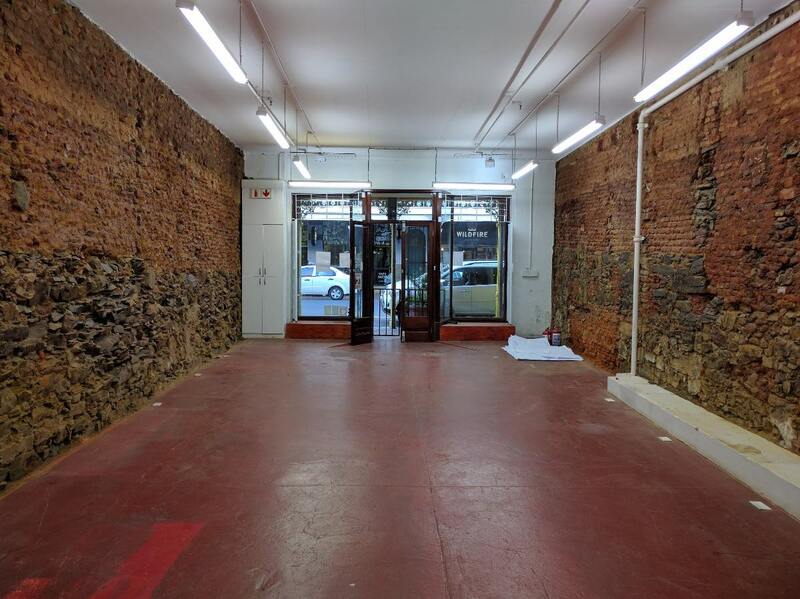 100 sqm plus a small courtyard, is available immediately under very flexible terms and including a fully approved liquor license for on consumption! The price? 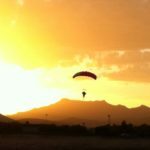 It depends… You can either rent it under market related terms or partner with me and get support from an industry leading team. 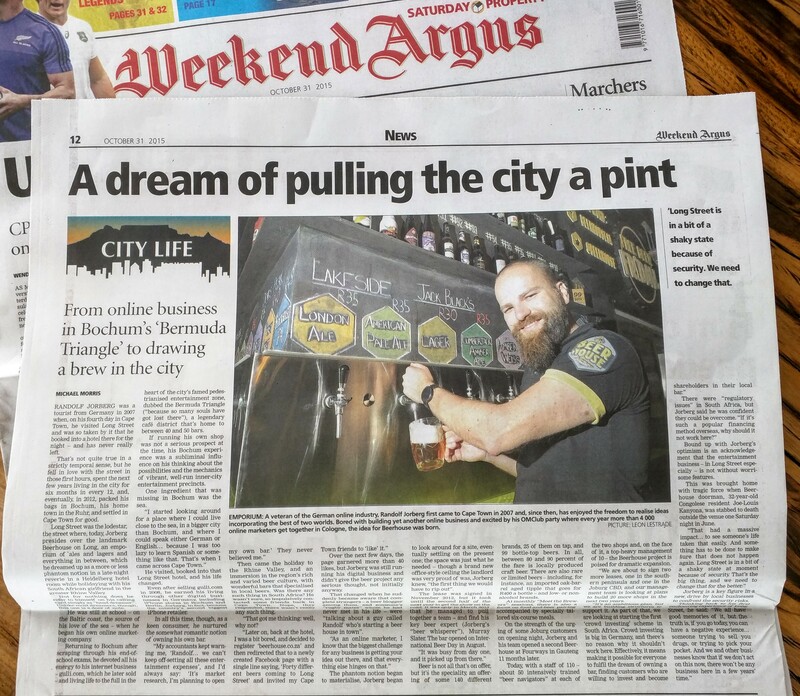 As founder of the Beerhouse and Long Street Association I got a real interest to draw new and old crowds back to Long Street and do our part. The ideal partner would build an exciting destination business around craft spirits and mixed drinks, that complements the leading craft beer variety, that we serve at Beerhouse upstairs. Hipster credentials not required. 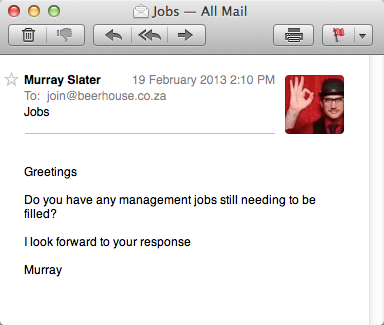 Please send a brief (2-3 pages) business overview, ideally with plans, financial and personal background, pictures or mood boards, intended timeline and preference on the rental/partner question to randolf@beerhouse.co.za. See this 360° photo for a good impression – it’s shot standing in the existing divider wall, which can easily be removed. It’s not often, that a journalist manages to listen and ‘get you’ in a way, that his writing describes you better than you could do yourself. But Michael Morris is one of these skilled writers and his article appeared in the Weekend Argus on 31st of October. EMPORIUM: A veteran of the German online industry, Randolf Jorberg first came to Cape Town in 2007 and, since then, has enjoyed the freedom to realise ideas incorporating the best of two worlds. Bored with building yet another online business and excited by his OMClub party where every year more than 4 000 online marketers get together in Cologne, the idea for Beerhouse was born. That’s not quite true in a strictly temporal sense, but he fell in love with the street in those first hours, spent the next few years living in the city for six months in every 12, and, eventually, in 2012, packed his bags in Bochum, his home town in the Ruhr, and settled in Cape Town for good. Long Street was the lodestar, the street where, today, Jorberg presides over the landmark Beerhouse on Long, an emporium of ales and lagers and everything in between, which he dreamed up as a more or less phantom notion in a late-night reverie in a Heidelberg hotel room while holidaying with his South African girlfriend in the greater Rhine Valley. Not for nothing does he refer to himself on his calling card simply as “head dreamer”. Unlike most dreamers, though, this one is a doer of note. He was still at school – on the Baltic coast, the source of his love of the sea – when he began his own online marketing company. Returning to Bochum after scraping through his end-ofschool exams, he devoted all his energy to his internet business – gulli.com, which he later sold – and living life to the full in the heart of the city’s famed pedestrianised entertainment zone, dubbed the Bermuda Triangle (“because so many souls have got lost there”), a legendary café district that’s home to between 40 and 50 bars. If running his own shop was not a serious prospect at the time, his Bochum experience was a subliminal influence on his thinking about the possibilities and the mechanics of vibrant, well-run inner-city entertainment precincts. One ingredient that was missing in Bochum was the sea. “I started looking around for a place where I could live close to the sea, in a bigger city than Bochum, and where I could speak either German or English… because I was too lazy to learn Spanish or something like that. That’s when I came across Cape Town.” He visited, booked into that Long Street hotel, and his life changed. Even after selling gulli.com in 2008, he earned his living through other digital businesses in Germany, including iPhone stores in Bochum and Berlin. Jorberg, in fact, became the country’s second biggest iPhone retailer. In all this time, though, as a keen consumer, he nurtured the somewhat romantic notion of owning his own bar. “My accountants kept warning me, ‘ Randolf… we can’t keep off-setting all these entertainment expenses’, and I’d always say: ‘ It’s market research, I’m planning to open my own bar.’ They never believed me.” Then came the holiday to the Rhine Valley, and an immersion in the region’s rich and varied beer culture, with wonderful bars that specialised in local beers. Was there any such thing in South Africa? 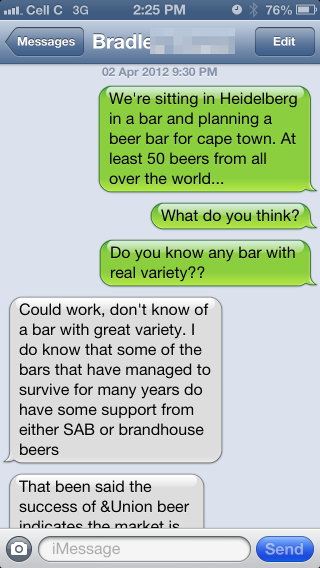 He wasn’t sure, so impulsively contacted some friends back in Cape Town. Nope, they responded, there wasn’t really any such thing. “That got me thinking: well, why not? 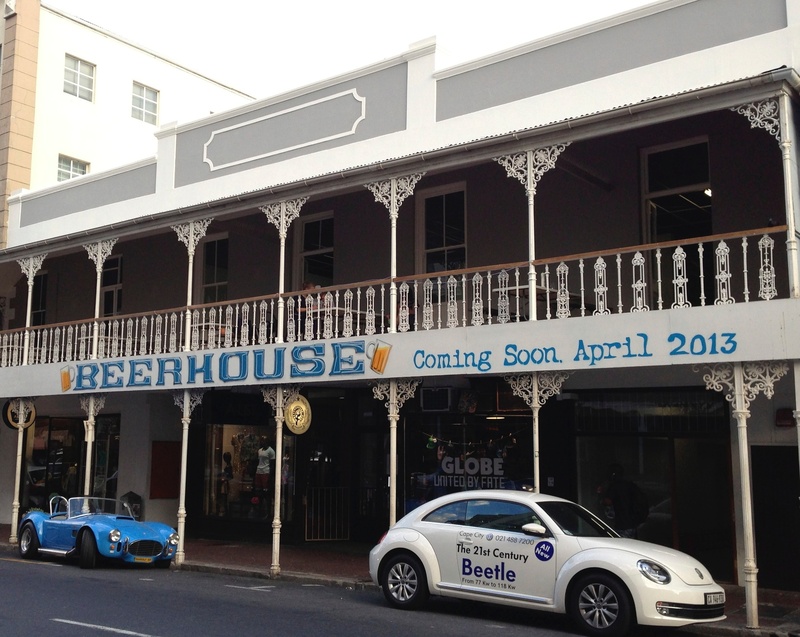 “Later on, back at the hotel, I was a bit bored, and decided to register ‘beerhouse.co.za’ and then redirected that to a newly created Facebook page with a single line saying, ‘Forty different beers coming to Long Street’ and invited my Cape Town friends to ‘like’ it.” Over the next few days, the page garnered more than 40 likes, but Jorberg was still running his digital business and didn’t give the beer project any serious thought, not initially anyway. That changed when he suddenly became aware that complete strangers – a beer blogger among them, and someone’s “rugby mates” whom he had never met in his life – were “talking about a guy called Randolf who’s starting a beer house in town”. “As an online marketer, I know that the biggest challenge for any business is getting your idea out there, and that everything else hinges on that.” The phantom notion began to materialise, Jorberg began to look around for a site, eventually settling on the present one; the space was just what he needed – though a brand new office-style ceiling the landlord was very proud of was, Jorberg knew, “the first thing we would have to rip out”. Beer is not all that’s on offer, but it’s the speciality, an offering of some 140 different brands, 25 of them on tap, and 99 bottle- top beers. In all, between 80 and 90 percent of the fare is locally produced craft beer. There are also rare or limited beers – including, for instance, an imported oak-barrel aged tipple that goes for R400 a bottle – and low- or nonalcohol brands. At monthly “Meet the Brewers” sessions, there is also a focus on food-and-beer pairing accompanied by specially tailored six-course meals. 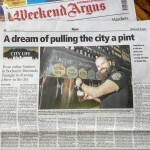 On the strength of the urging of some Joburg customers on opening night, Jorberg and his team opened a second Beerhouse at Fourways in Gauteng 11 months later. Today, with a staff of 110 – about 50 intensively trained “beer navigators” at each of the two shops and, on the face of it, a top-heavy management of 10 – the Beerhouse project is poised for dramatic expansion. 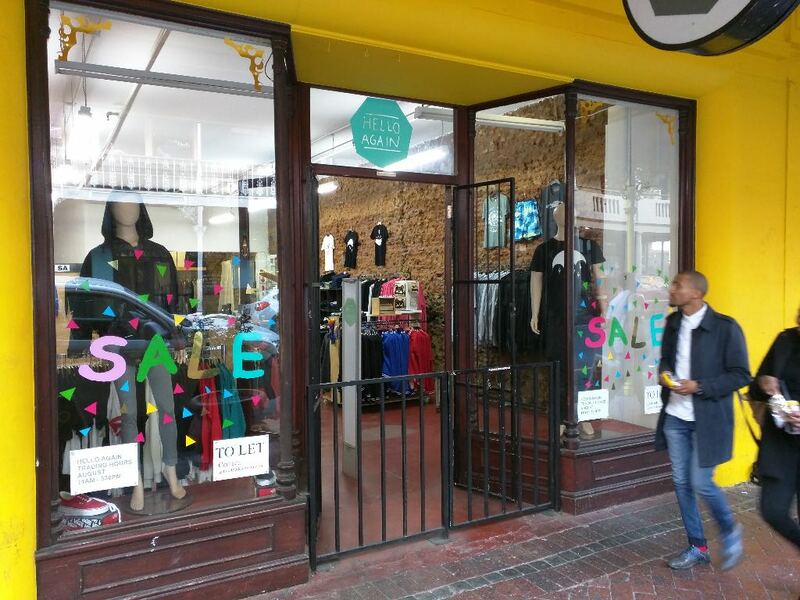 “We are about to sign two more leases, one in the southern peninsula and one in the Joburg CBD, and our management team is looking at plans to build 20 more shops in the next two years. “It’s an ambitious plan, but we are building structures to support it. As part of that, we are looking at starting the first ‘crowd investing’ scheme in South Africa. Crowd investing is big in Germany, and there’s no reason why it shouldn’t work here. Effectively, it means making it possible for everyone to fulfil the dream of owning a bar, finding customers who are willing to invest and become shareholders in their local bar.” There were “regulatory issues” in South Africa, but Jorberg said he was confident they could be overcome. “If it’s such a popular financing method overseas, why should it not work here?” Bound up with Jorberg’s optimism is an acknowledgement that the entertainment business – in Long Street especially – is not without worrisome features. Global Entrepreneurship Summit 2015 in Kenya and a lesson in personal branding. More than 1500 entrepreneurs and policy makers from all(!) 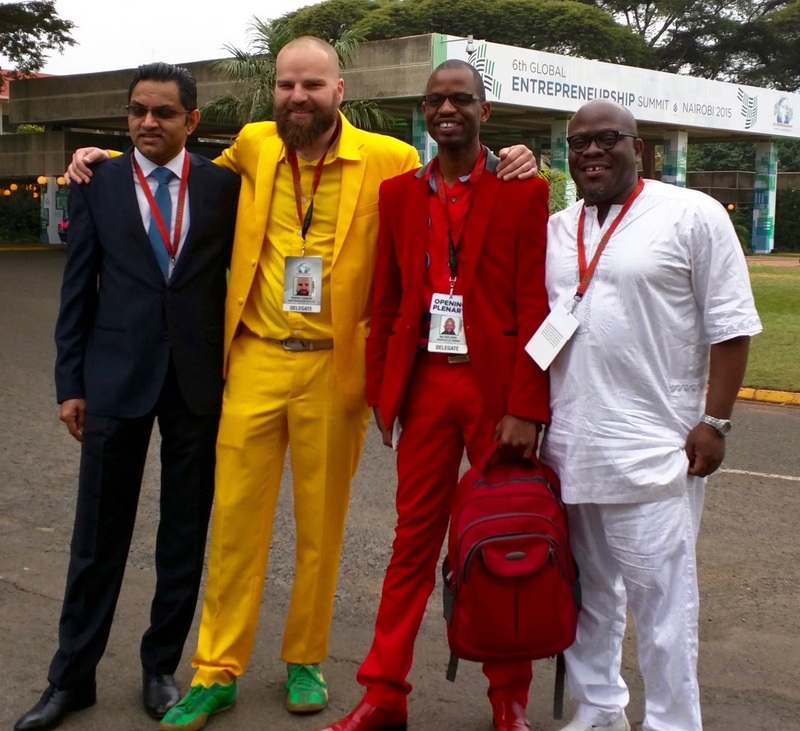 over the world flocked to the Global Entrepreneurship Summit 2015 in Nairobi, Kenya, from July 24th-26th. Due to my affiliation with the Ampion Venture Bus, I was privileged to be invited to represent Beerhouse and Springlab at this mega-event, hosted and (except flights) fully paid for by the US Government and sponsors. The event was attended by US President Barack Obama, and several other well known figures and celebrities, amongst them Akon, Shark Tank judges, Miss Americas, etc. But first and foremost it was entrepreneurs from all stages of growth, self-made billionaires meeting rural farmers from Africa. Without knowing stats, I’d guess, that half of the audience was US American and Kenyan, while the rest of us were coming from all corners of the world, no continent left uncovered. If you were now expecting a huge celebrity spotting event, you did not attend the right place. With the exception of Obama himself (who was obviously talking point #1 and closely guarded during his half day stay on the UN compound) they attended their panels and mingled with the crowds afterwards, but the strength of the event was the fact, that entrepreneurs from all possible backgrounds got together and spoke one universal language of creating progress, learnings, challenges, growth and opportunities together. 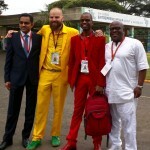 My tailormade yellow suite that I purchased as a 200 US$ joke on my Thailand-India-Kenya trip earlier in 2015 turned me into something of a talking point, making me explain the yellow colour, that’s representing the Beerhouse brand colour. I really don’t ever wear a suit and my decision to take it to #GES2015 was based on the formality of the event and that my second and only other suit is not home in South Africa, but stored in my german apartment, in case of family funerals I might have to attend. On day #1 I was dressed in jeans and repeatedly mistaken for my doppelgänger – the ‘White African’ Eric Hersman, who spoke on a morning panel. On day #2 I was absolutely overwhelmed by the number of people approaching me and asking about the reason for wearing the full suit, leading into many interesting conversations and spontaneous photo shoots. On day #3 this continued, but I was now also approached by people, who heard the story of a yellow german / south african / beer merchant / incubator / hospitality operator from others and approached me offering valuable introductions to beer or hospitality people or even an interest to license the concept. 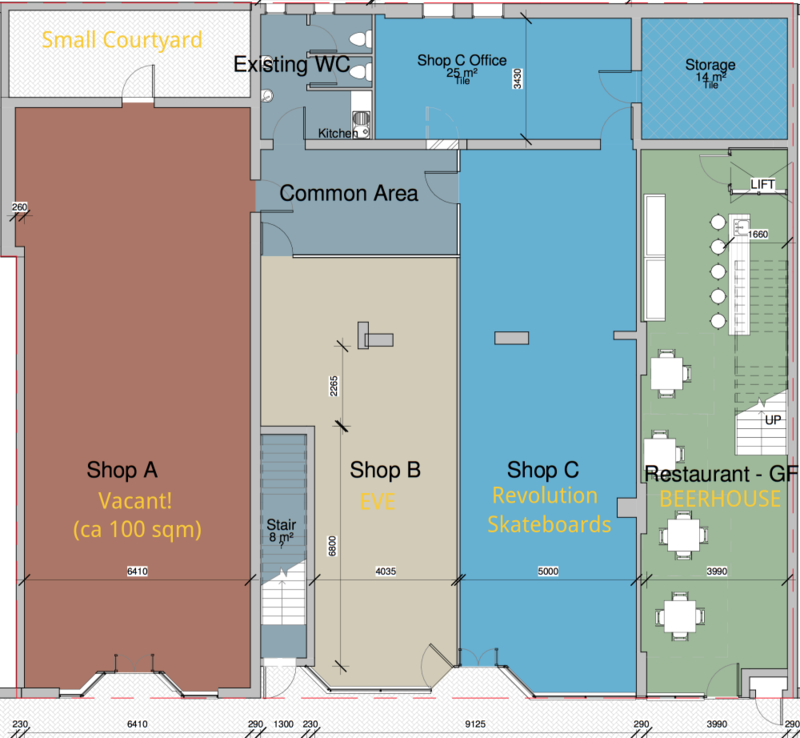 Other than Babies, the Beerhouse concept took a solid 16 months from conception to birth. It was exactly two years ago on April 2nd, 2012, that I was sitting with my (then pregnant) girlfriend in a beer bar in Heidelberg, discussing the various available Beers and their stories and wondering why no similar place exists in Cape Town. Quick market research through text messages and Facebook followed and I realized, that there might indeed be a gap in the South African market. Thanks to the pregnancy, we went back to the hotel quite early that evening and I reserved the most obvious domain name beerbar.co.za redirected it to a new Facebook page, invited my Capetonian friends and posted some beer related content, before going to bed. I couldn’t be bothered to work on the Beerbar idea when we returned from our Eurotrip, as pregnancy and Jane and my work on the OMClub party took up all my time, but I did notice the friends congratulating me on the new bar business. Just a few days after the birth of my daughter it happened: A family member told me, that some of his rugby mates asked him, ‘whether he heard about these mavericks, that were planning to open a beer bar with more than 40 different beers’. Beer blogger Joakim had written about us, although we had no location, no experience in the hospitality industry – we did nothing, but promise beer variety and I realized it wasn’t only friends & family, that liked my idea. 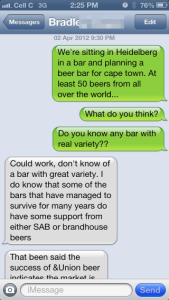 We had planted an idea into peoples mind and they actually really wanted a beerbar with 40+ different beers! We finally started to seriously turn a drunk crackpot idea into a business. Even without any experience in the industry, it is obvious, that a successful bar business starts with a good location and Long Street is where it’s at. After looking at smaller available vacancies, we finally called the ‘Restaurant space to let’ number, that we walked past so many times and found a fascinating venue we knew would work. Few days after signing the contract for 223 Long Street we still had no real plan how to open a bar, but were ready to spread the word. 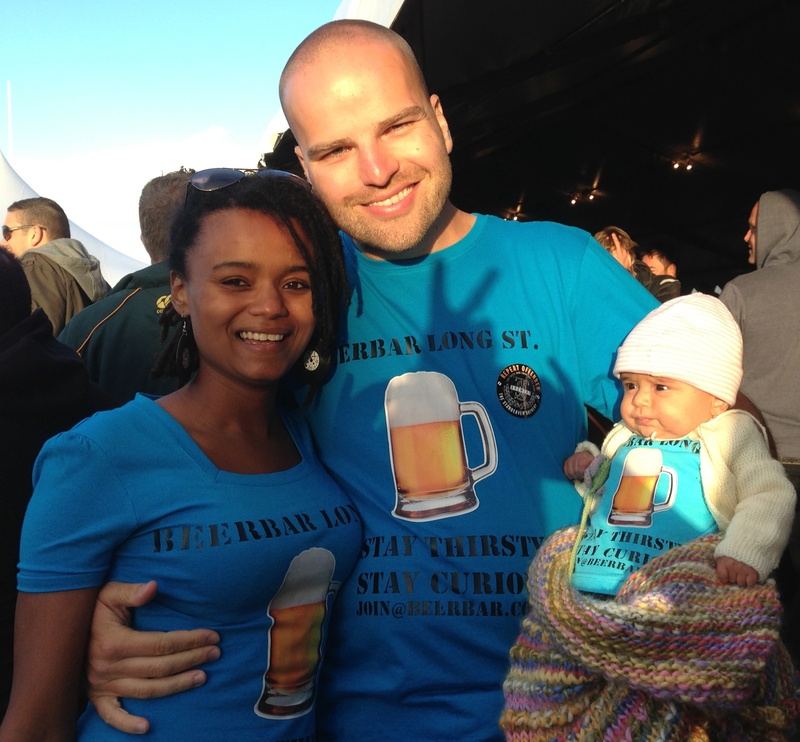 We printed blue Beerbar T-Shirts and visited the Cape Town Festival of Beer, where we met all the brewers, that are now our best partners for the first time and we also found our vision: give our guests at the Beerhouse a 365 day a year beer festival experience and be the tasting room for the South African craft beer industry. Is RASA sending this SMS only to me? 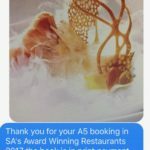 Restaurant Association of South Africa and their marketing tricks.